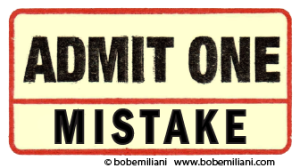 Big-name Lean consultants, trainers, thought leaders, educational organizations, etc., talk a lot about the importance of making mistakes as a prerequisite for learning. Yet, you rarely hear them talk about any mistakes they’ve made and what they have learned from them. You hear them talk only about successes – lots of successes – but you almost never hear them publicly talk about failed kaizens, botched Lean transformation efforts, leaders who felt the Lean training did not deliver value compared to the price, executive training disasters, and so on (this is a type of illogical thinking called “special pleading“). These things happen more often than people realize, but remain unspoken because it is bad for business and can turn executives off to Lean. True as this may be, knowing about problems can help each of us more effectively advance Lean management. So, as I have done before, let me share with you the story of mistakes I made in executive training, what I learned from it, and how it resulted in improvement. A few years ago, I met with the executive in-charge, managers, and facilitators of the Lean Office of a large and very successful technology company to plan a Lean leadership executive education course for the CEO and his direct reports. The Lean Office folks learned about me through my Practical Lean Leadership workbook and felt that my approach to teaching REAL Lean and the “Respect for People” principle were extremely important to the company’s future success. We carefully reviewed all the training material and discussed where changes needed to be made. During this time, Lean office people became concerned whether or not the executive team would be receptive to any Lean leadership education. I too had concerns and worried that the training might not go well – so much so that I offered my training materials to the Lean Office for them to do the training. They declined. At the start of the course, the CEO gave a wonderful, passionate, hour-long speech about the current state of the company and what the future could bring. As with any company mired in decades of batch-and-queue material and information processing and facing increasing competition, the situation was ugly. The CEO did a great job spelling out the need for change in the company and emphasized that this would happen only through personal changes made by each senior executive. The CEO set me up perfectly. It was without doubt the best foundation ever laid for me by a CEO prior to the start of a course. The CEO asked his direct reports to use the Lean leadership course to develop specific personal action plans. The training began with the “Respect for People” principle. But, some executives expressed concerns about its relevancy to knowledge work. I explained that this principle applies to all work, especially to people who do creative and innovative work. Other executives believed that Lean management, overall, was not applicable to the work performed in technology businesses. Unfortunately, the executives fell into an anchoring trap that disabled their ability to process the new information they were receiving. They had difficulty letting go of their “we’re different” attitude. There was obviously a satisfaction with the current leadership mindset, skills, and capabilities, despite the need for personal and organizational change. Training on the “Continuous Improvement” principle was less effective than planned because the executives did not like hearing that they had to learn new things through daily practice, to build the knowledge and skills characteristic of effective Lean leaders. Instead, they were interested in “quick wins.” And they wanted lower-level people to make quick changes that reduced costs, reduced lead-times, and improved productivity. They did not want to learn about Lean management by participating in kaizen. They just wanted results produced by other people. The training was a failure. It turned out that the CEO and his direct reports were only interested in Lean tools (Fake Lean), not Lean management, not Lean leadership, and certainly not (REAL Lean). They wanted to mandate Lean, not lead a Lean transformation. All they needed was a quick training course on Lean tools with a clear explanation of financial impact – how much savings and when it would fall to the bottom line. The dozen or so executives, most less than 50 years old, did not want to think or do anything differently themselves. They wanted big changes in the company without making any big changes to themselves. The Lean Office people knew this, but hoped that my training would educate the executive team on the larger potential of REAL Lean and the critical importance of the “Respect for People” principle. Why use my Lean leadership course to develop specific action plans, reflecting personal changes that needed to be made by each senior executive – which is what the CEO said he wanted – when all that the CEO really wanted was short-term operating improvement executed by lower-level employees? Why were the desires of the of the Lean office, who sought REAL Lean, so far out of alignment with the CEO and executive team who were only interested in Fake Lean? In hindsight, it was premature to train the executive team on Lean leadership, given their very low-level understanding of Lean management or even of Lean tools. I pulled the andon cord and reflected on the mistakes I made in this process. The major mistake I made was to agree to do the training. I should have recommended preliminary steps to better prepare the executives for what was to come, such as a few individual assignments or short online training courses to better understand Lean management. What did I learn? I learned that enthusiasm for my work among among even relatively senior people may not accurately reflect the views of top leaders. I therefore improved my process for engaging executives prior to any training to ensure that this type of misalignment does not occur in the future.